The all new Ameo compact sedan has been launched in India on June 5th 2016 (Yesterday) at a very affordable price tag of Rs 5.14 Lakhs ( Ex-showroom Mumbai). The Ameo is the much anticipated car from Volkswagen and the auto enthusiasts across the country have been waiting for the car very eagerly. 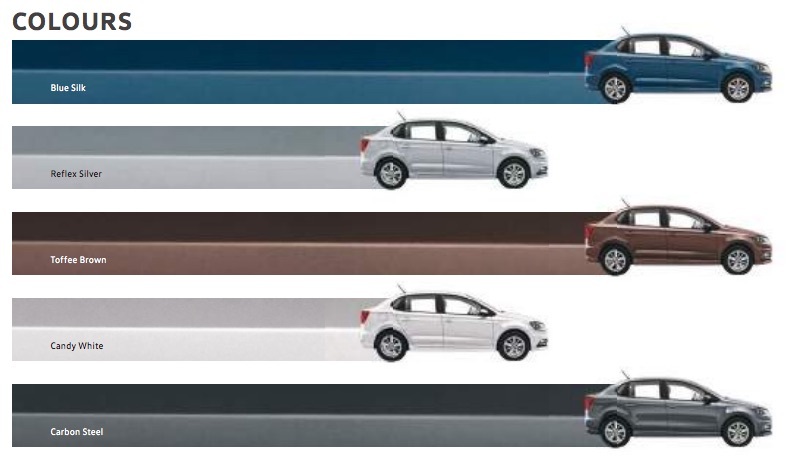 Check out the photos of Volkswagen Ameo in different color shades. Let us talk about the specifications of Ameo. Currently offered only in the petrol version, the all new Volkswagen Amro is powered by 1198cc, 3 cylinder petrol motor which is mated to a 5-speed manual transmission gearbox. The maximum power output of Volkswagen Ameo is 55 Kw at 5400 rpm and the maximum torque output of Ameo is 110Nm at 3750 rpm. Talking about the dimensions of Ameo, the car’s length measures 3995mm, width measures 1682mm, height measures 1483mm and the wheelbase of the car measures 2470mm. Volkswagen Ameo comes with 2 Airbags as default. The fuel tank capacity of new Volkswagen Ameo is 45 litres, the bootspace is 330 litres. The mileage of Volkswagen Ameo is 17.83 Kmpl (ARAI figure). The fuel efficiency of Ameo is pretty decent when compared with the other compact sedans in this segment. The Ameo is available in 3 trims. The Ameo trendline variant costs INR 5,13,864 (Ex-showroom Mumbai), comfort line version of Ameo costs INR 5,87,914 (ex-showroom Mumbai) and the highline trim of Ameo is priced at INR 6,91,680 (Ex-showroom Mumbai). With 5 color options and 3 trims in the offering, Volkswagen Ameo opens up lot of choices for the consumers. Which Ameo color are you going to choose among Blue, Brown, White, Silver, Steel? Let us know by commenting below.